Prostar motors is a conveniently placed competitive car Sales & Service center located at 139 to 141 Burwood rd Hawthorn. 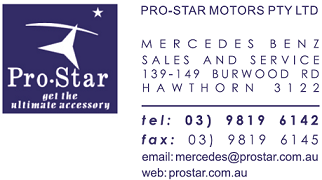 Established in 1982 Prostar motors has been a family run business for over 22 years specializing in Mercedes Benz. You will be more than satisfied with our exceptional one-on-one personal service and rest assured with our warranty system included on almost all parts and cars.